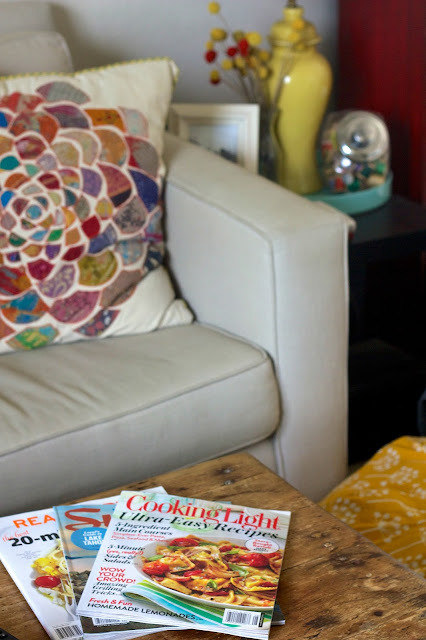 This post is part of a social shopper marketing insight campaign with Pollinate Media Group™ and Cooking Light, Sunset, and Real Simple magazines, but all my opinions are my own. http://cmp.ly/3/8vNxcO. I have a boatload of cookbooks, but for some reason, most of my meal planning and recipe inspiration comes from magazines. There's just something so satisfying about picking up a magazine in the grocery store aisle, flipping through the pages when you get home, finding a recipe that makes your mouth water, tearing out a page, posting it on the fridge, shopping for ingredients and making the meal that week. More than anything, I love being enticed by the photos of the meals, which not all cookbooks offer. My go-to meal planning magazine companions since college have been Cooking Light and Real Simple. Since moving to Colorado, Sunset mag is another favorite. They're always full of attainable recipes that are flavorful and usually pretty darn healthy. 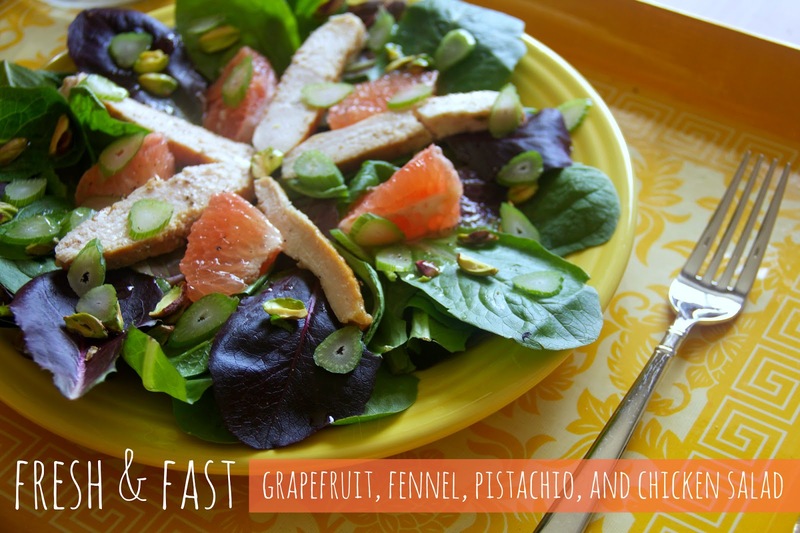 We always have a lot going on, so fast and fresh are the two things that are most important in my meal planning. Not to mention, Chase and I are on week two of a 21 day challenge of eating nothing that contains dairy, gluten, soy, sugar, artificial sweeteners, or alcohol. Needless to say, salads are getting a bit monotonous and I've been on the hunt for a fresh & new one to make for us. 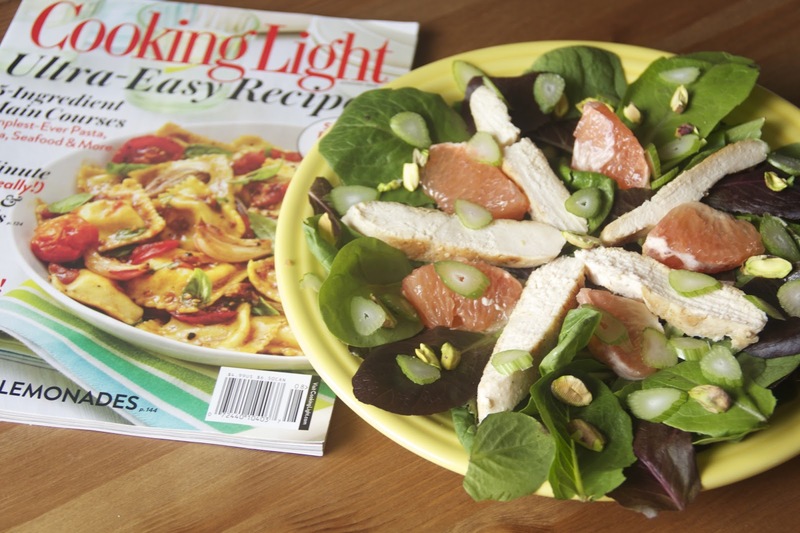 This recipe was inspired by a simple, on the go recipe in Cooking Light magazine. Brown bag lunches don't have to be boring. I love that I can have everything prepped before, throw it in a tupperware, onto a plate, or in a mason jar ((using the BNTO for Cuppow!)) and eat it on the go. Although the dressing does have a tiiiiny bit of sugar in it, I chose to "look the other way" and go for it anyways. Honey would be yummy too. The dressing is so delicious - definitely my favorite part! I headed to my local Safeway to pick up the ingredients for this delicious salad and all the flavors worked together perfectly. 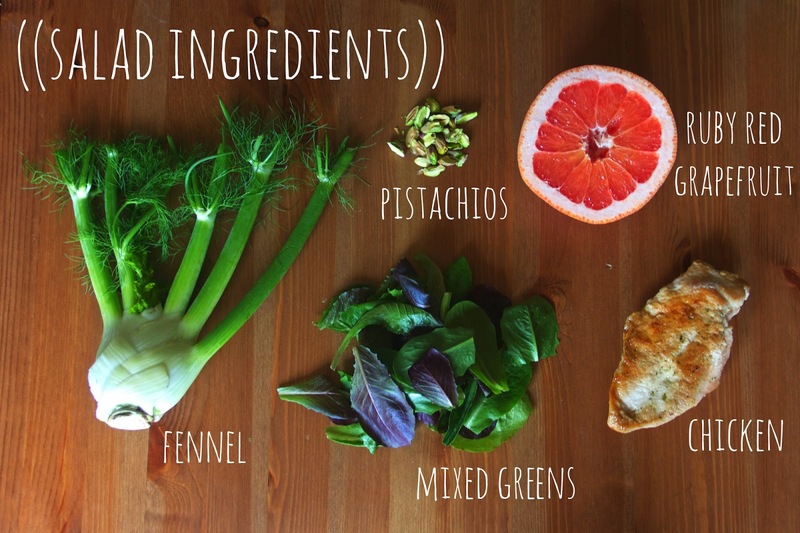 The tangy grapefruit paired perfectly with the salty pistachios, the spiciness of the fennel, and the savory chicken. Ready for the recipe? The following makes two salads, so double it if you're making it for more! 1. Cook & slice chicken, shave fennel, and cut grapefruit into half or quarter moons ((making sure to remove all of the membrane or..."white stuff")). Rinse greens and shell pistachios if needed. 2. 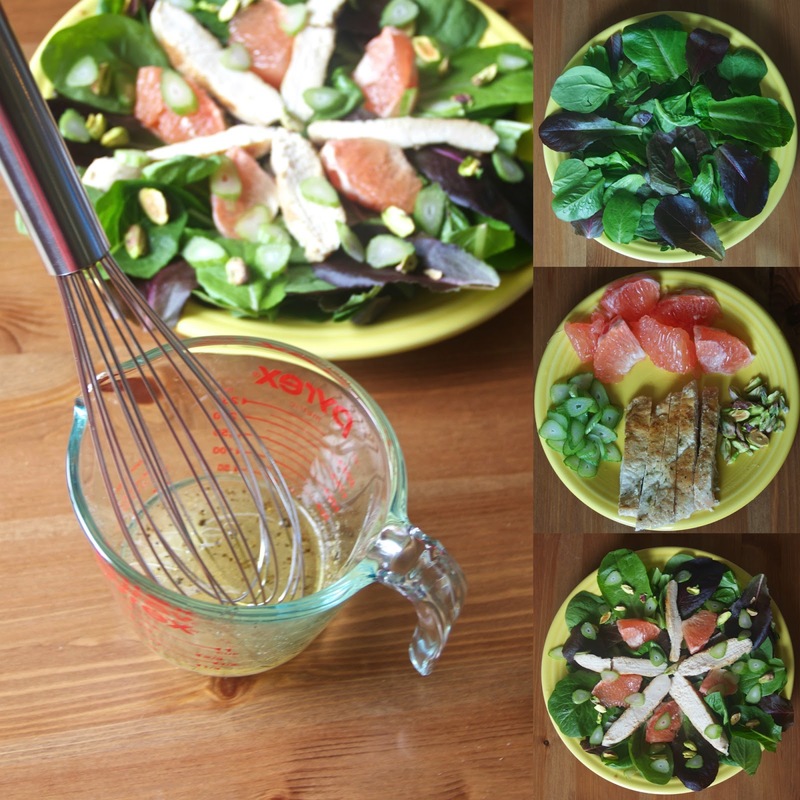 Prepare salad dressing by pouring olive oil and juice from 1/2 a grapefruit into a small measuring cup or mixing bowl then whisk in salt and pepper. Set aside. 3. Place mixed greens in bowl or on serving plate. 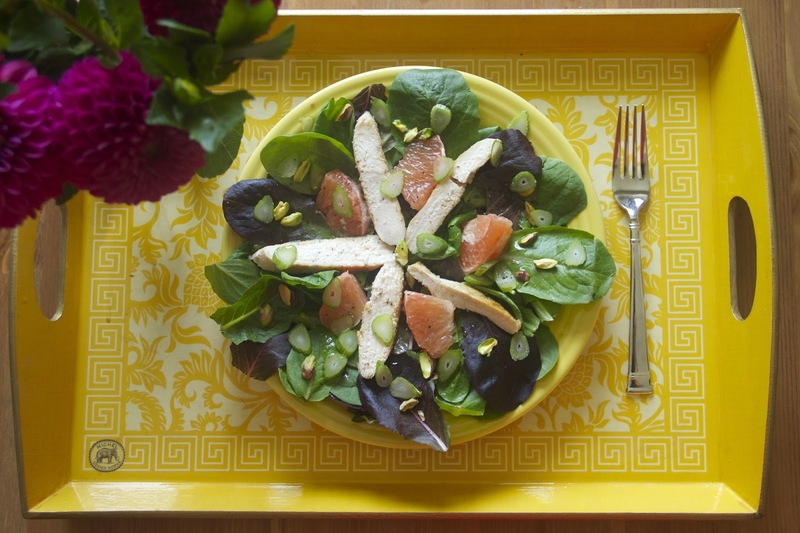 Top with chicken, pistachios, grapefruit, fennel. 4. Drizzle with dressing and enjoy! 1. 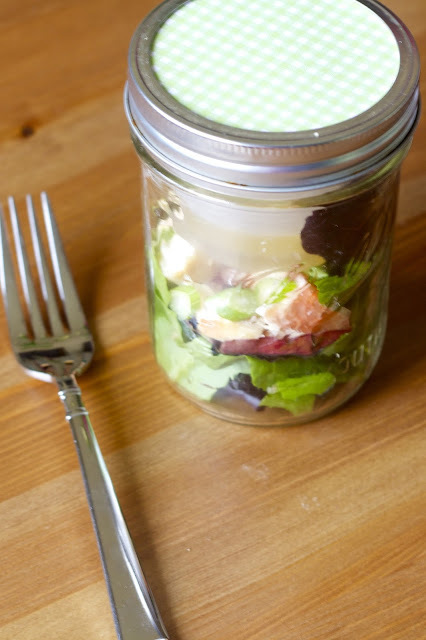 Pack your dressing separately and toss right before you eat to prevent a soggy salad. BNTO for cuppow! is a perfect for this. What's your favorite on-the-go lunch to make? Looks delicious!! I'm so making this! I've never had grapefruit on a salad before, but it sounds tasty! This sounds heavenly–we can't get enough of grapefruits lately! YUM!!! 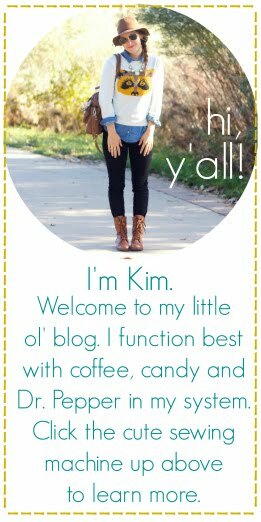 I haven't clicked over from blog lovin to say HELLO lately :) this looks incredible! My lunch of choice is a kale salad with avocado dressing OR an avocado and cheese sandwich. yum!